This story was submitted by Robert of Sea Scouts Ship 100. 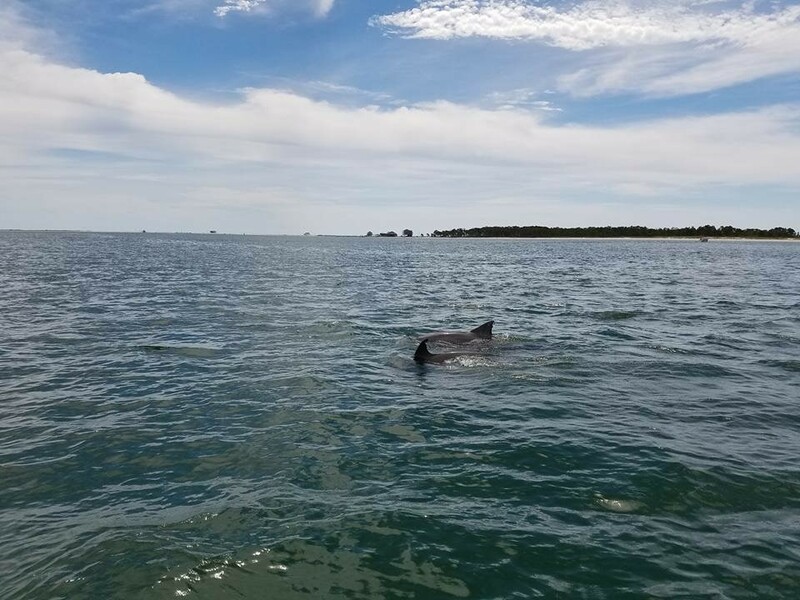 The ship took their annual trip to Florida this Spring and spent three days sailing through the Saint George Sound and surrounding areas. 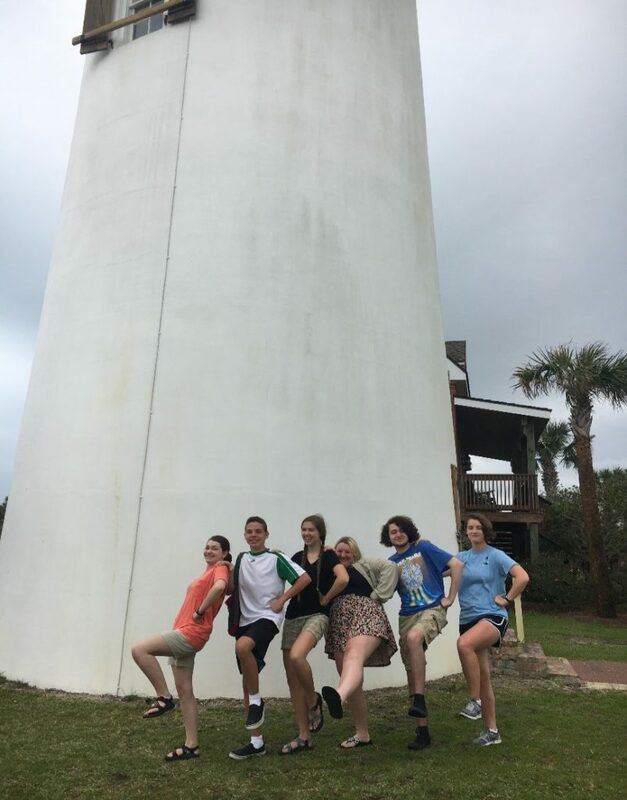 Sea Scouts Ship SouthWinds 100 of the Atlanta Area Council recently completed a sailing adventure in Saint George Sound and the Gulf of Mexico near Carrabelle, Florida. Ship 100 was founded in 2008 and completed its first trip to Florida in 2009. We’ve sailed the Gulf nearly every year since. 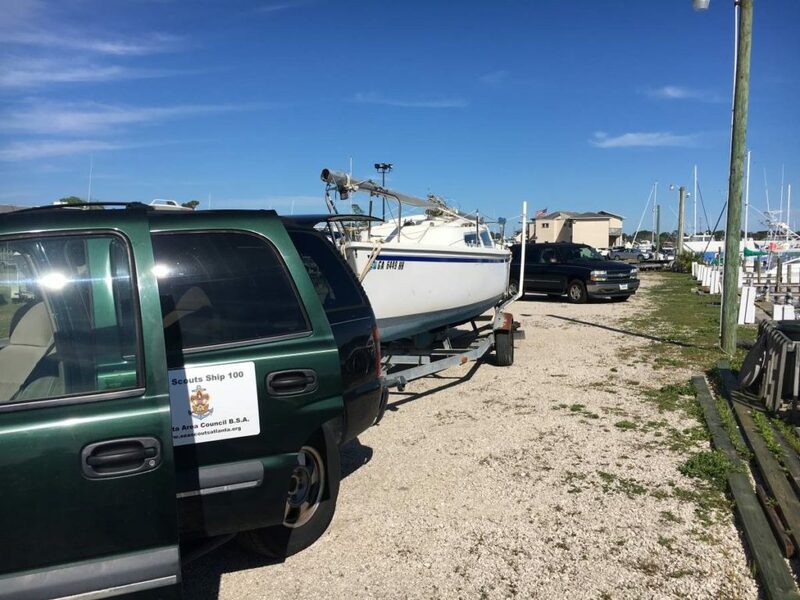 The Activity Chairman and Ship members plan for months in advance to prepare the boats, arrange food, make condo/slip reservations, plot GPS waypoints, and review charts. We typically sail Catalina 22s, which are trailered easily. Stepping masts gets easier on each trip, too. Ship 100’s fleet includes six Catalina 22s and we find them easy to sail with a crew of two to as many as five on board. This year we left early on a Saturday morning and headed south with boats in tow. Our destination was the Moorings at Carrabelle, which includes a boat slip with each condo rental: one for females and the other for males. We got boats set up and splashed the evening we arrived so we could get an early start the next morning. 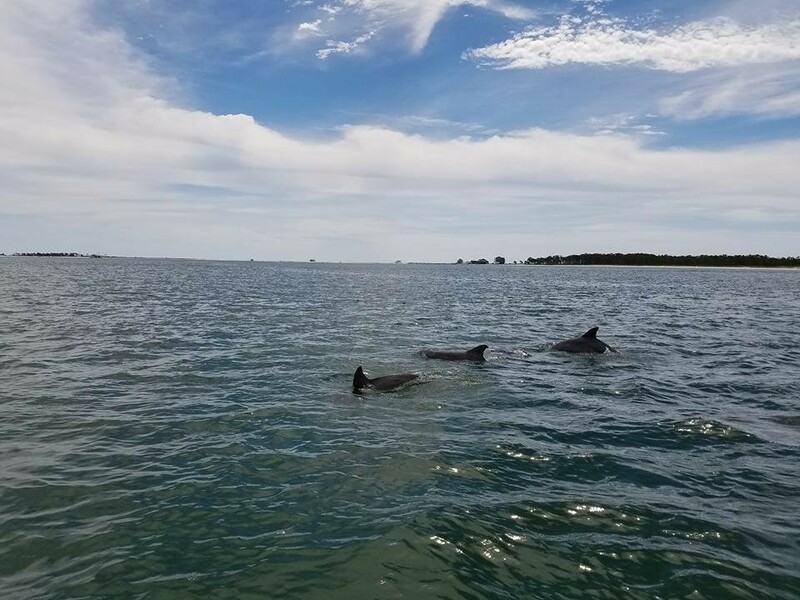 We scheduled three days of sailing in the Gulf of Mexico and in the sheltered Saint George Sound behind two barrier islands: Dog Island and Saint George Island. The Ship was able to sail two of the three planned days. This occurred two days after the I-85 road failure in Atlanta and the first full day of our Spring Break. As such, we encountered a lot of traffic and ended up with about an 8.5-hour drive. 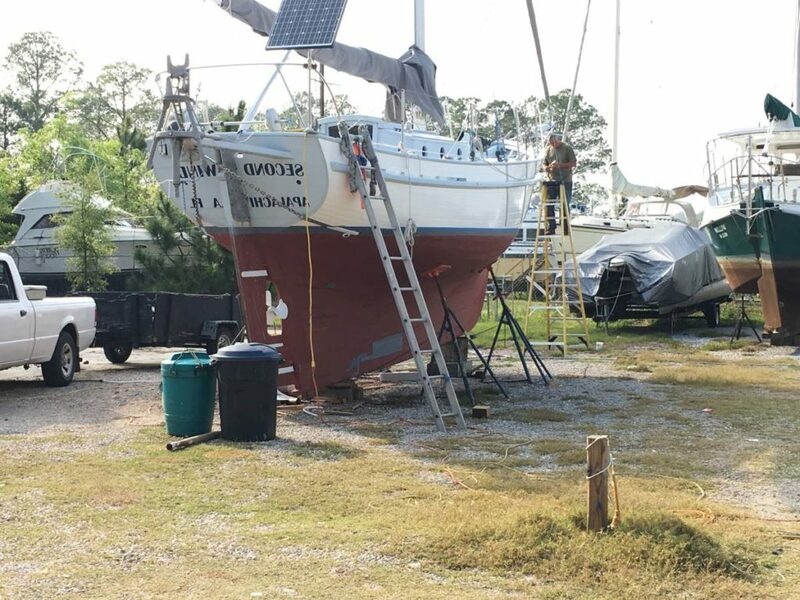 Upon arrival at the Moorings at Carrabelle, we unloaded vehicles, stepped masts, and splashed boats so they would be ready for sailing Sunday morning. We sailed 22 miles on our first day out: down the Carrabelle River, out into Saint George Sound, and through the pass (i.e., COLREGS Demarcation Line) separating Dog Island and Saint George Island into the Gulf. We practiced a “heave to” where you can stall the forward movement of the boat, thus giving those on board a break on the water. This is done by back-winding the jib and turning the helm far to one side causing the boat to slide sideways. The winds and seas gave a calm, relaxed few minutes while we talked and took more pictures. We traded our smaller jib for the larger genoa, then sailed back through the pass and around the north side of Dog Island for some playtime at Shipping Cove beach. We saw more wildlife than on any of our previous trips. 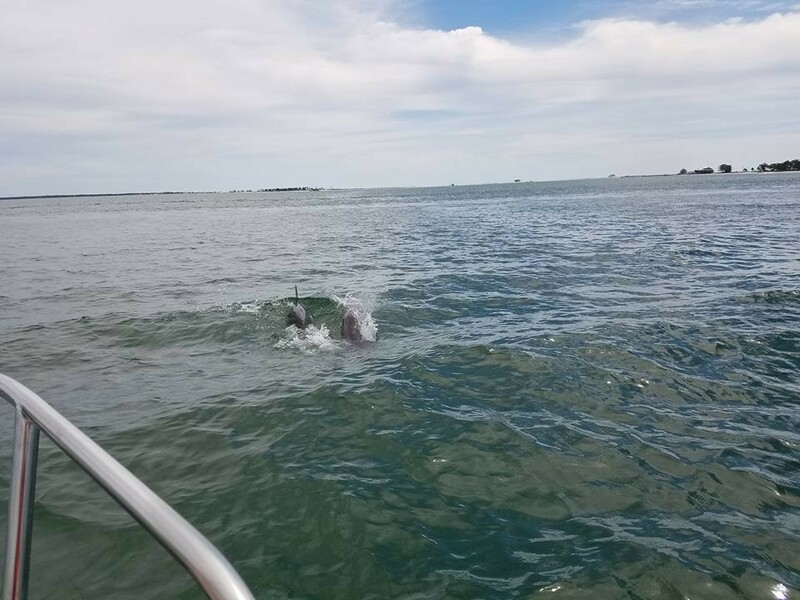 Both boats encountered a pod of over 15 dolphin swimming close by, with some jumping out of the water. One boat saw a loggerhead turtle surface by their boat twice. 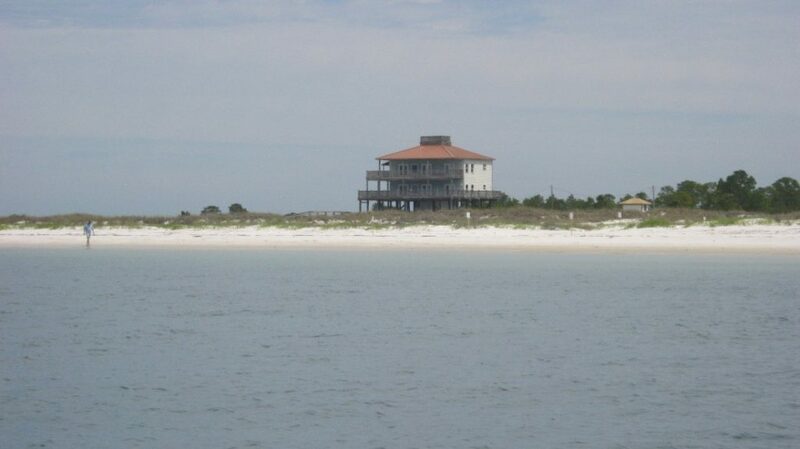 One of the many beautiful houses on Dog Island; this one on the eastern end and showing off a copper roof. 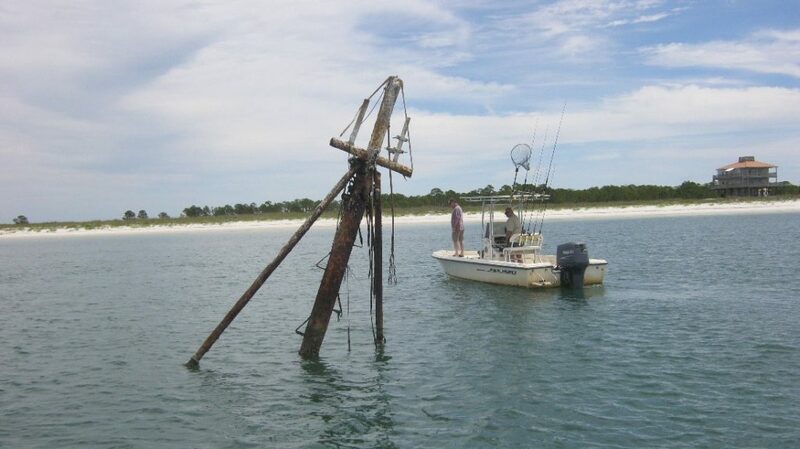 This sunken trawler is in the pass between Dog Island and Saint George Island. We saw a lot of boats circling it and fishing around it, so it must be a hot spot for fishing. 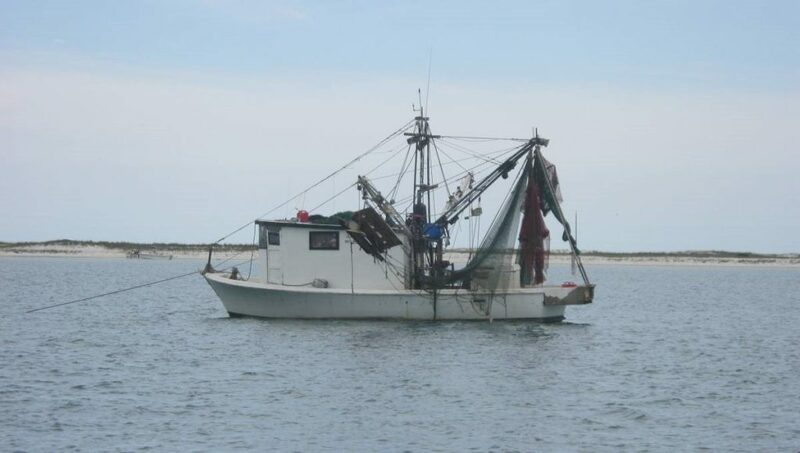 There are often fishing boats and trawlers on anchor in the Sound. Some of the many dolphin that put on a great show for us. 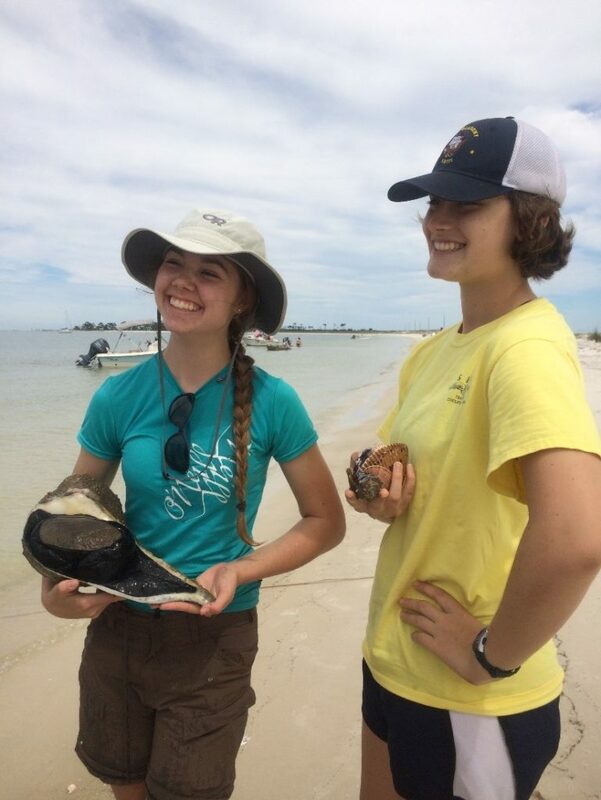 Two of our Scouts found a “Lightning Whelk” at Shipping Cove in knee deep water at Shipping Cove beach. 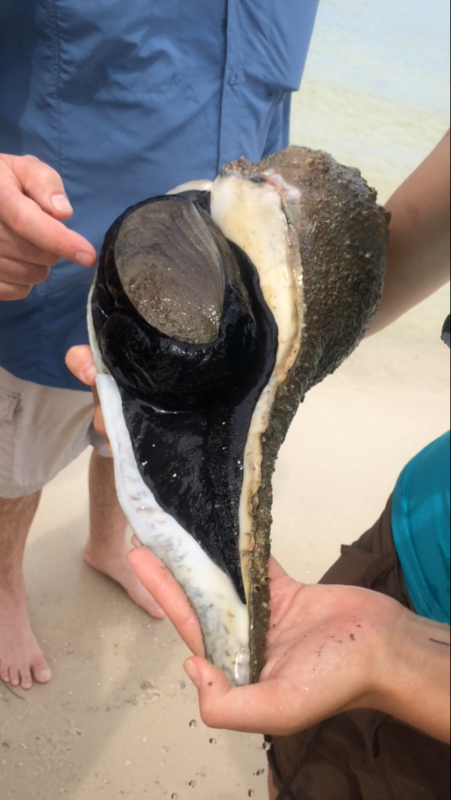 This is in the whelk family and is a carnivore, unlike a conch, which is an herbivore. We did return “Nelson” back to where he was found. 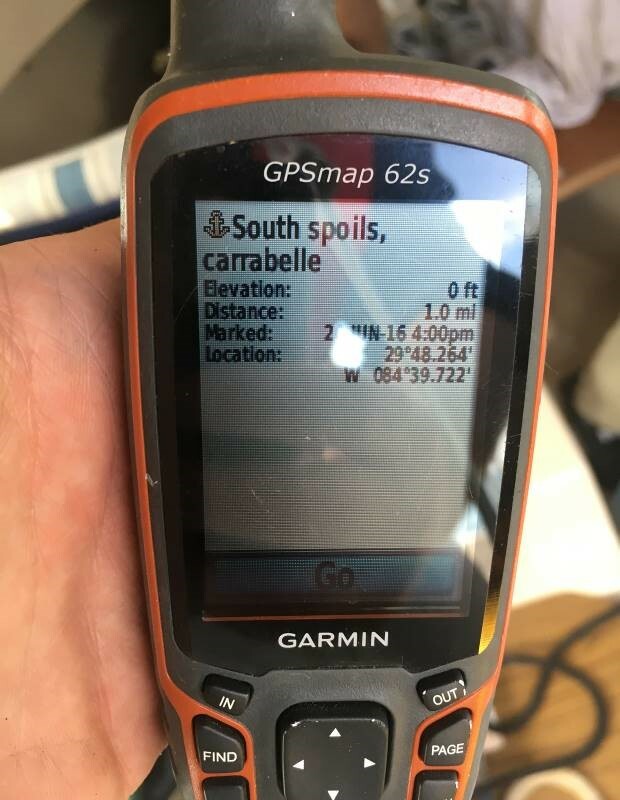 Here is a photo of a handheld GPS unit, one of the many navigation tools we used to keep us out of the shallows. Additionally, we used a compass, paper charts, and an iPad chart plotter app. Reading the paper charts is very useful and a practical skill to learn. Paper charts don’t require batteries. We cancelled our sailing for the day due to approaching bad weather. We visited a local boat yard and met up with a local Scouter, who gave us a tour of his personal boat as well. We spotted this military landing craft from WWII, and were told it helped deliver all of the home building supplies to Dog Island. We drove in to Panama City Beach for a day of fun while we were off the boats. We knew to stay off the boats because of the approaching weather. We waited out the morning for the remainder of the bad weather to pass by. 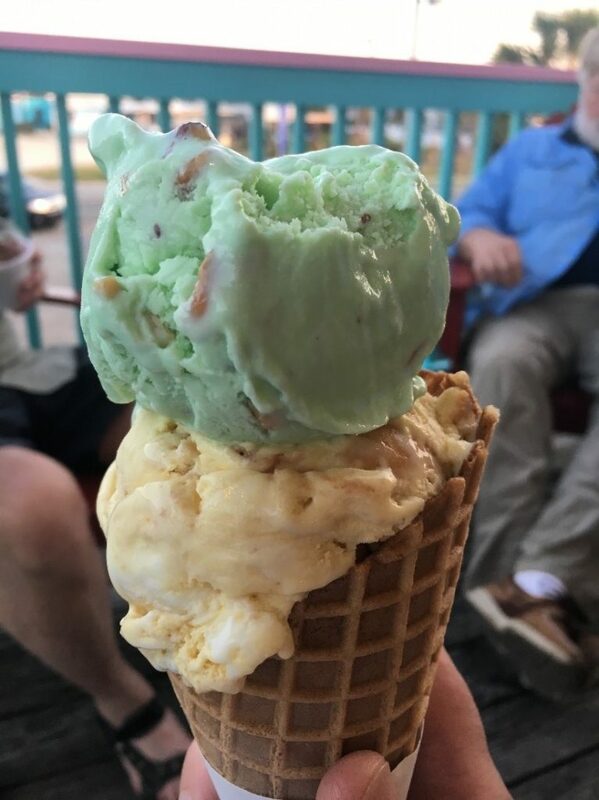 We spent this time carrying on some of the traditions we started during our first trip to Carrabelle and Saint George Island: getting ice cream and climbing the Saint George Lighthouse. We sailed 11 miles that afternoon, and still had time to break down boats and get them back onto the trailers. 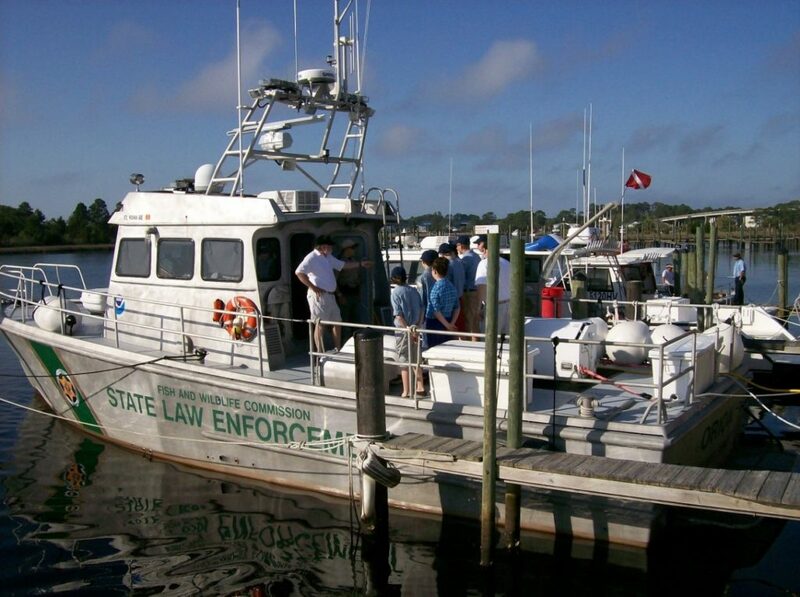 On several occasions, we’ve been given a tour of the local FWC Gulf Sentry 85’ patrol boat. This boat has a crew of 4-7 officers doing 24-hour shifts. They spend their time doing rescue work, patrolling, and educating the public on indigenous wildlife like sea turtles. 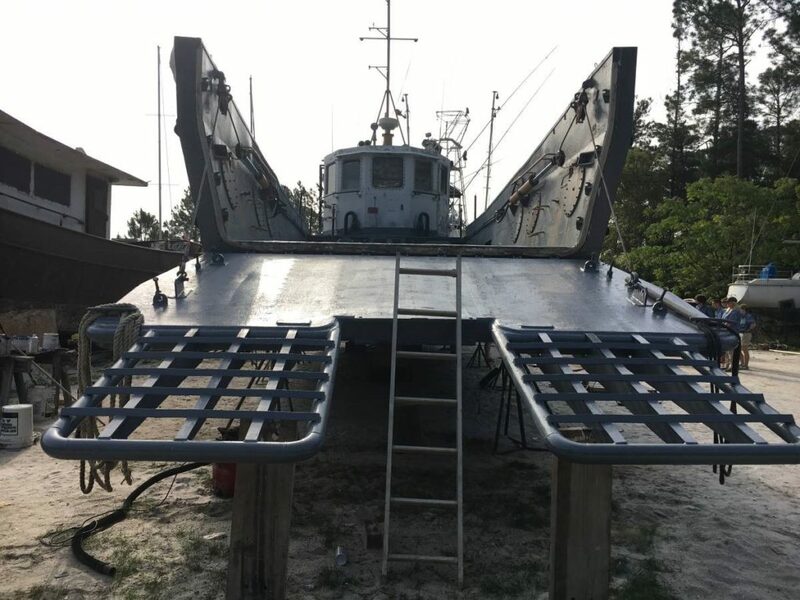 This boat was rebuilt in 2010 adding a new tower and ramp for an inflatable on the back.In prior years, we’ve also been able to meet up with the Coast Guard for a tour of a base and a ride on a 41’ cutter in Panama City Beach. We completed our annual trip to Florida having lots of fun, learning, and fellowship. This trip also let us practice basic navigation skills, because often we cannot see our destination. 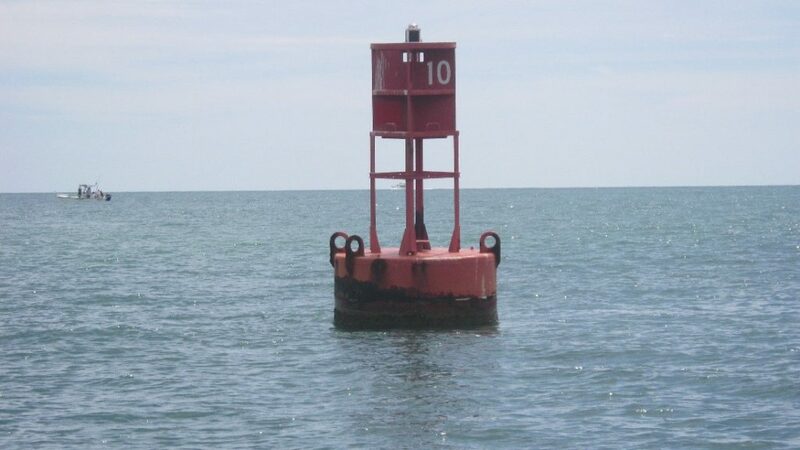 Plus, this is a safe place that allows for mistakes and the use of safe boating skills. We also get to listen to all sorts of radio traffic from Tampa to Mobile, including Coast Guard, working boats, and pleasure craft. 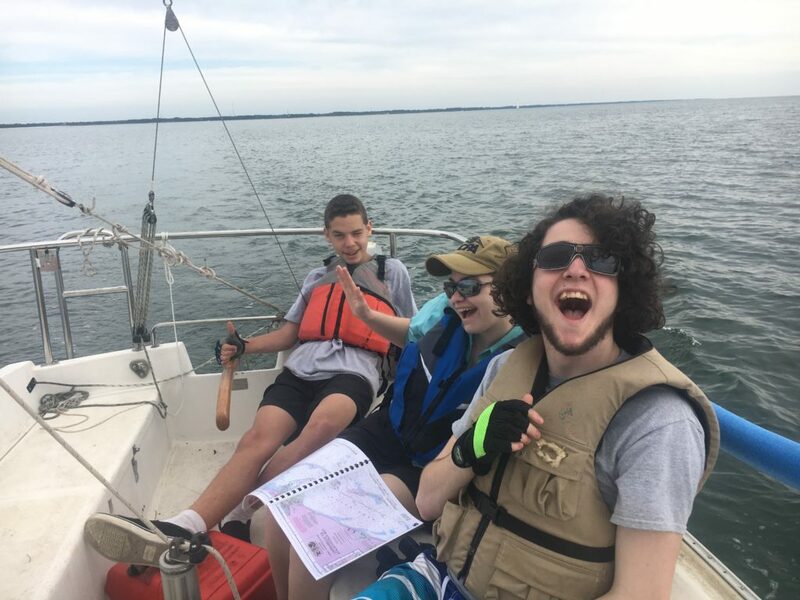 This story was submitted by Robert of Sea Scout Ship 100. The ship took their annual trip to Florida this Spring and spent three days sailing through the Saint George Sound and surrounding areas. Click here for more information on Sea Scouts. Tagged sea scouts. Bookmark the permalink.